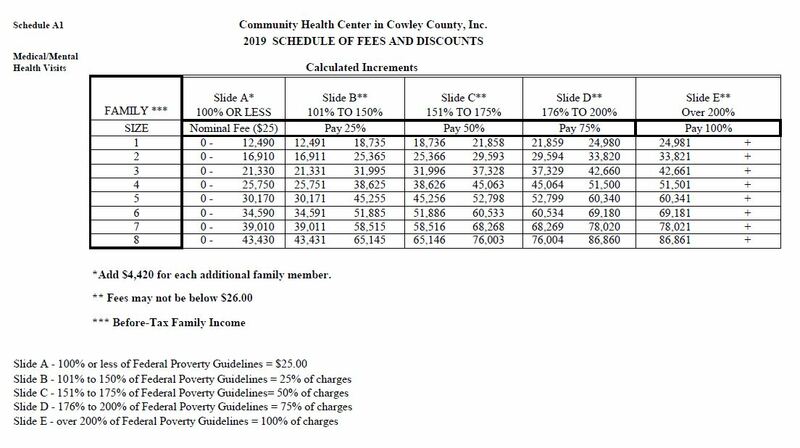 The Community Health Center offers a sliding-fee discount schedule to provide primary care health services at a lower cost based on an individual or family’s ability to pay. These discounts are determined by the current Federal Poverty Guidelines. Uninsured patients that earn at or less than the current federal poverty level are charged a nominal fee of $25 to receive primary care services. Individuals or families earning 100% to 150% of the federal poverty level are charged 25% of the regular fees; 151% to 175% are charged 50% and 176% to 200% are charged 75%. A typical office visit regularly costs $150 in our service area. Payment plans are also available. FQHCs work to ensure that financial barriers to care are minimized. The Community Health Center in Cowley County operates as patient centered medical home. Health centers are not urgent care facilities. Although the health center offers many of the same services as an urgent care facility, the expectation for prevention of disease and illness is that our patients maintain a medical home with us. Patients are currently receiving low-cost primary and preventative medical services and will be offered additional low-cost, high quality health services (oral, mental, pharmacy) as the center develops and grows. Additional support services are also planned. Community health centers create savings in healthcare every time a patient opts for an exam and treatment at the first sign of a health issue. Every health center tailors its services to meet the unique needs of the people in its surrounding community. This local approach to healthcare, combined with an emphasis on comprehensive preventative care, generates $24 billion in annual savings to the healthcare system; and for the American taxpayer, local, state and federal governments and public and private payers alike. This scale allows us to configure the right fee for you, we strive to ensure that financial barriers to care are minimized. If you have any questions regarding payments please contact us at 620-221-3350 or email us at info@cowleyhealthcenter.org. Does the governing board need to develop and approve the supporting sliding fee discount? No. Governing boards are required to approve the sliding fee discount program policies that establish the foundation for operating procedures. Development and implementation of related supporting operating procedures rests with the health center staff under the direction of the key management staff. Are health centers permitted to have a single line on their fee schedule for a “diabetes visit” that includes the provider encounter, lab work, and a mini session without nutritionist? Yes. When constructing the fee schedule, a specific health center service along with associated laboratory services and/or medically related supplies and equipment may be combined into a single fee, as long as this consistent with both prevailing standards of care and locally prevailing charges. Do health centers have to assess income and family size for all patients including insured patients? Health centers must assess income and family size for all patients, both for health Center Program reporting purposes (refer to the HRSA UDS Reporting manual) and for determining whether they are eligible for sliding fee discounts. Eligibility for the sliding fee discount is based on income and family size and no other factors. Is it permissible for a health center to include assets in its definition of income? No. Health centers may not use assets tests as an additional eligibility threshold, nor may they create a “net worth test” (i.e., a combined threshold of assets and income). Assets are not considered income; assets are an economic resource, while income is comprised of earnings over a given period of time. For example, a rental property would be considered an “asset,” but the income generated from this rental property could be considered “income.” Health centers are permitted to request information on assets for the purposes other than the sliding fee discount scale eligibility, e.g., assessing eligibility for private or public benefit programs that require asset information. What does a health center have to include in assessing and documenting a patient’s income? The health center governing board determines in policy what types of income are included or excluded in defining “income,” as well as the associated documentation needed to assess income for individual patients, as long as such policies do not created barriers to care. As with all sliding fee discount program policies, the health center’s nominal charge(s) must be applied uniformly too all patients. How do health centers consider family members, not living with the patient but largely supported by the patient’s income, in their definition of “family size”? Health centers have the flexibility to define family size to include these family members as part of their definition based on the governing board’s determination that such definition is appropriate for their target population and service area. As with all sliding fee discount program policies, the health center’s family size definition must be applied uniformly to all patients. What steps must a health center take if an individual who is auto-assigned to another Medicaid managed care provider wishes to be a health center patient? The health center would inform/educate individuals regarding their option to receive care from their assigned primary care provider. In cases where the individual requests to be re-assigned to the health center, the health center may also provide assistance with the process of reassignment/re-enrollment consistent with health center policies and procedures and any additional guidance provided by the state. Medicaid agency or state law. Once registered by the health center, such individuals must be assessed for income and family size in accordance with health center policies and procedures, and charged based on the health center’s Sliding Fee Discount Schedule (SFDS), is applicable. How would a health center count the number of pay classes in the sliding fee discount scale for the purpose of determining if the Sliding Fee Discount Schedule meets the “3 or more” pay class rule? For example, in the following sample Sliding Fee Discount Schedule, the SFDS has four pay classes (B, C, D, and E) above 100% of the FPG and at or below 200% of the FPG. All health center SFDSs must have at least three discount pay classes above 100% and at or below 200% of the Federal Poverty Guidelines. Are health centers required to have a nominal charge for individuals at or below 100% FPG? No. The decision to have a nominal charge is at the discretion of the health center governing board. What is considered a nominal charge? A nominal charge must be a fixed fee that does not reflect the true value of the service(s) provided and is considered nominal from the perspective of the patient. In addition, it is not intended to create a payment threshold for patients to receive care.  Nominal charges are not “minimum fees,” “minimum charges,” or “co-pays.” Health center boards are responsible for determining whether the establishment of a nominal charge is appropriate for the target population. If electing to do so, the board must set a nominal charge(s) that meets the definition above. As with all sliding fee discount program policies, the health center’s nominal charge(s) must be applied uniformly to all patients. Is it permissible for health centers to require proof of application/proof of denial for insurance or other documentation (e.g., exemptions) before offering services on a sliding fee discount schedule (SFDS)? No. Health centers may not require patients to enroll in public or private insurance and/or related third party coverage, nor may eligibility for sliding fee discounts be based on factors other than income and family size. If a current or new patient is not able to, is exempt from, or chooses not to pursue insurance coverage, the health center must continue to serve that patient, and charge the patient in accordance with the health center’s SFDS for the service(s) provided, as applicable. As a reminder, health centers must educate patients on options available to them based on their eligibility for insurance and/or related third party coverage. Are insured patients who are at or below 200% of the Federal Poverty Guidelines eligible for the sliding fee discount program? Yes, subject to the potential legal and contractual limitations. Please visit the HRSA website and examine the PIN pages 11-12. In order to reduce barriers to care and improve health outcomes, a health center wants to purchase eyeglasses from a third party for its patients who receive optometry services, they are not typically included in the optometry service based on prevailing standards of care. If locally prevailing charge for eyeglasses is $100 and the total cost to the health center is $30, may we charge patients a flat fee of $40? Yes. This type of supply/material (eyeglasses) falls within the category described in Section VII.F: Sliding Fee Discount Schedule: Other Considerations. As long as the health center has determined that the charge for this supply is less than the locally prevailing charge and this below-market charge facilities generated from these charges must be used to further the objectives of the project by benefiting the health center’s patient/target population, and for purposes not specifically prohibited under section 330. Are health centers required to participate in all insurance plans? No. Health centers are required to participate in Medicaid and CHIP and must make every reasonable effort to collect reimbursement from Medicare, Medicaid, CHIP, and other private and public third party payers in order to maximize revenue from these sources. Beyond these requirements, health centers should consider their target population(s) and the costs and benefits of such participation when determining the specific public and private health insurance plans in which to participate (e.g., Medicaid, managed care plans, Qualified Health Plans).